Ha! Music may well soothe the savage beast, but what can it then do for the soothed beast? And for any of his soothed friends? Music Bibliography - Guides and handbooks, etc Guides etc. Here you will find a friendly, feasty and feisty treatment of musical history drawn from the world's records... A slow-growing website, perhaps, but destined to become large, with an emphasis on music in Australia. The main purpose of this website is to deliver news and views on the history(s) of humanity's use of music to the present... a big ask! HoTM! The website for music demons by Dan Byrnes and Ed Matzenik. Music is one of the great joys of life - one of the reasons this website originates. But why does this website originate in Australia? It is partly because Australia is a country of recent historical origin, 1788++, meaning, as decades pass by, Australia as a nation of migrants becomes a collection point for the latest technology of all kinds from the Western World. Therefore, we have become a collection point for the latest in music technology. Related, is our habit of inviting famous world acts to our cities for performances. Voila! Australia is interested in music, new artists, new instruments, and new music technology! HoTM! will be fascinated to trace all such developments. Phone: Mob (Australia): 0478 644 736. Some graphics appear here courtesy of their creators, Dan Byrnes, Joel Byrnes, Lou Farina. Something is also owed here to conversations over time with Tamworth-based fiddler/guitarist, and Chameleon Musician, Andrew Clermont. (Pictured right, and quite a man!) 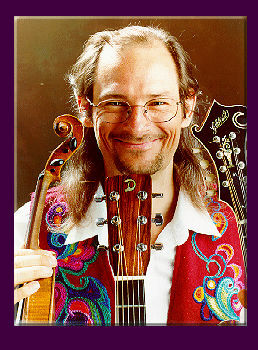 Andrew is sponsored as he travels by Epoch violins, Gilchrist mandolins, Maton Guitars and White Swallow Banjos.